It’s December and a new year is just around the corner. Can you hear it asking you: What have you accomplished this year? How do you feel in your life? What are you dreaming of for the new year? Over the past decade I’ve developed some creative practices that help me answer these questions and to create a more fulfilling life for myself. These practices go further than the standard new year’s resolutions and are powerful and inspiring. One of my favorite ingredients in this New Year’s recipe is choosing a Guiding Word for the year. A Guiding Word is like your theme song, your motto or your lighthouse. Choosing a guiding word is part searching, part sifting, part noticing. Through the process of saying words out loud, reading words, doodling, thinking about, and listing words, we begin to have a sense of which words are the sticky ones for us. Those are the words we want to underline. The words we want to own. The first time I chose a Guiding Word for the year, I was looking for something to embody a new direction for myself. I rolled soulful, energy, and spirit around on my tongue. I looked them up and thought about the definitions. I made lists. New words showed up like strength, guts, essence, pluck, verve. I thought about what I most wanted the word to represent for me and I sat with each of the top contenders for a bit. On New Year's Eve, I chose the word: SPIRIT. Or maybe it chose me. That year I followed old passions in new ways. I pushed myself courageously out of my comfort zone. I thought of myself as a leader in places I never had before. I composed spiritual music. And I got a lot clearer on what was important to me and what fed my spirit. I leapt into all my work with soulful energy. Spirit was, indeed, my guiding inspiration that year. 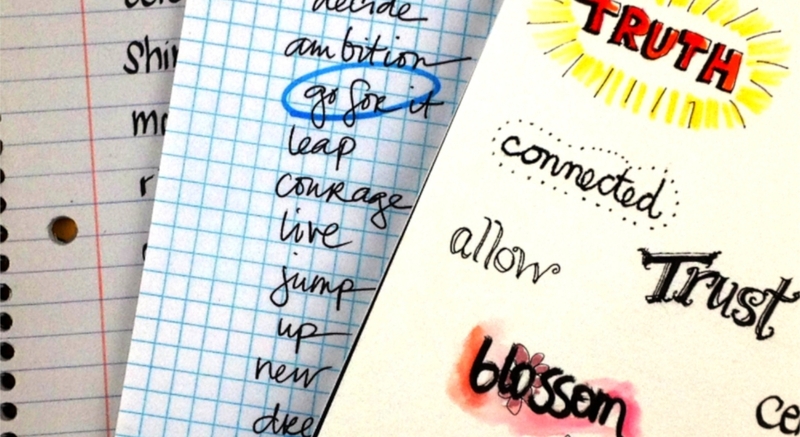 Word lists: Write down 20 words that come up when you think about how you want to feel this year. Use the thesaurus to look them up and collect more. Circle the ones that resonate. Search for more words! Journal: Take time to journal about the words that stand out. Which ones have meaning and relevance for the year ahead? Try it on: When you’ve culled the list down to your top choices, pick one and “wear” it for a day. Think about how that feels. Is it a perfect fit? If not, try another one, until like Goldilocks, you find the one that is jussssst right! Commit: Choose your word. I do this on New Year’s Eve! Creative expression: Find ways to keep it in front of you and remind you of it throughout the year. Make jewelry and art with your word. Create a vision board collage for your word. Put it on your refrigerator! Revisit it in six months. How is it showing up in your life? Want to explore other New Year’s intention setting practices on your own or with me? Check out the schedule of New Year’s retreat days at Unfold Studio this and next month. Pick up a copy of my New Year’s workbook, Come Back to Center, and use it as your guide (you can get it at a discount if you sign up for one or more of the New Year’s retreat days). This was first published in Sebastopol Living Magazine’s December 2018 issue.